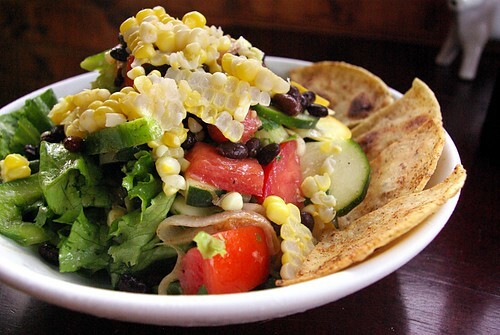 summer corn black bean and farm fresh vegetable salad dressed with cilantro and lime with spicy broiled white corn chips, originally uploaded by aarn! +11th August, 2009+. muddled a handful of chopped cilantro leaves and a crushed clove of garlic in the juice of 1/2 of a lime. mixed in a pinch of salt, pepper, and ground hot red pepper, 1t. of spicy dijon mustard, and 1t. of mayonnaise, then slowly whisked in 2T. of vegetable oil, to taste and consistency. tossed the dressing over some fresh leaves of lettuce, sauteed spring onions and black beans (seasoned with some cumin and crushed red pepper), thinly sliced cucumber, green and yellow squash, a nice tomato, another handful of fresh cilantro, and a boiled ear of sweet corn which had been cut from the cob. broiled a few small white corn tortillas, which had been tossed in a little vegetable oil, salt, pepper, cumin, and ground red pepper, until brown and crisp on top. plated the salad in some chilled bowls with a side of the spicy chips. looks awesome- I love all of those flavors! The corn chips look great - I'd never thought of broiling them before. And who can resist fresh corn on a salad? Yum. yeah, the chips should be broiled on a rack, these were not as crisp as they could have been. letting them sit out for a minute and cool, and not using too much oil is key. YOU ARE SO GOOD AT THE COOKINGS.